ArtStarts and professional photographer and media artist Anne Marie Slater have come together to bring the history of the Kingsway corridor alive for 120 Grade 3 to 7 students at two Kingsway area schools, Sir Guy Carleton and Charles Dickens Elementary. The last few months have seen Anne Marie paying regular visits to the schools, working closely with both students and teachers to lead and guide the project. 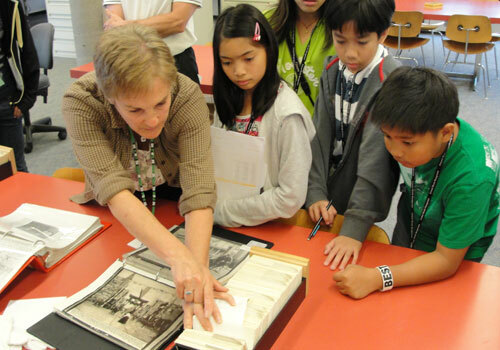 They began with a look into the past and a visit to the Vancouver Archives and the Museum of Vancouver. There, students poured through binders and books to discover what the neighbourhoods they call home used to look like, how people used to dress, what the cars used to look like, and how the street got its name. At the Museum of Vancouver, they got a taste of mid-century Kingsway, its car culture, its fashion and its politics. The following week was a study of present-day Kingsway. 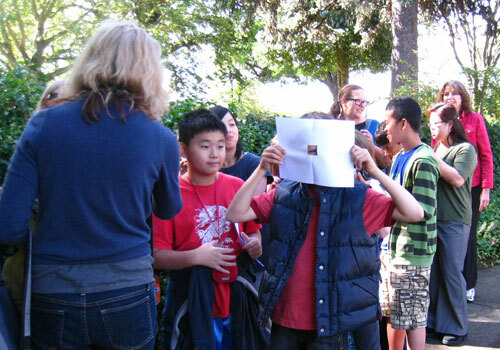 After an introduction to using the camera’s view finder to frame an image, students followed Anne Marie out of the classroom and onto the sidewalks. 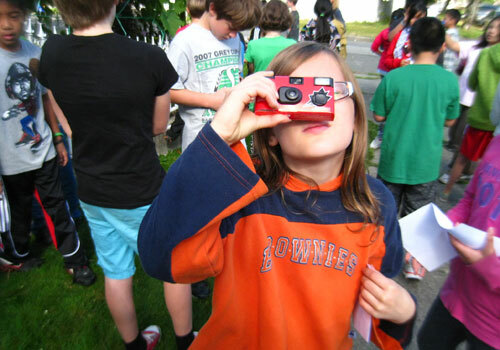 Armed with disposable cameras, they roamed through the residential streets and along the busy main road itself. Under the artist’s guidance they documented elements of the life they observe around them today. 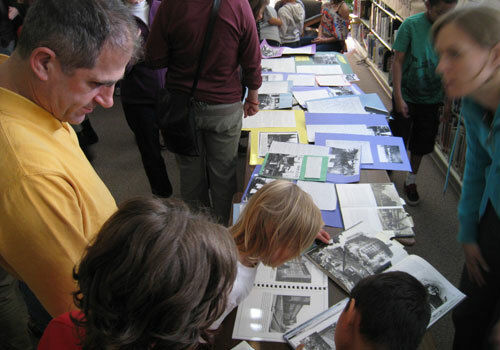 The past and the present came together at the "History Faire" open house that each school hosted. 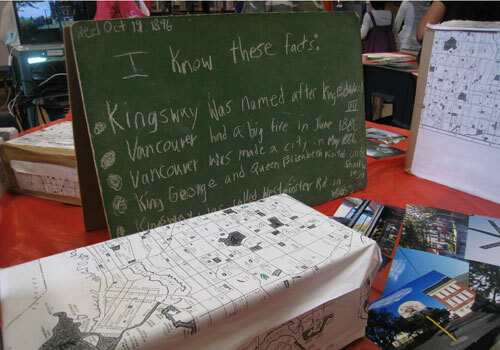 This was an opportunity for the students to display and share all the elements of learning that had happened in the classroom as part of the Kingsway Project, those led by the artist as well as those spearheaded by their classroom teachers Joanne Finnamore, George Prevost, Miranda Hounsell and Jody Polukoshko. The inspiration and excitement was evident as students who were posted at various display stations introduced their projects to visiting parents, students and teachers. 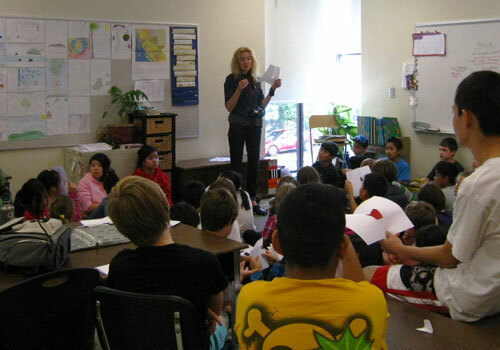 The Kingsway Project artist residency is presented by ArtStarts in Schools with support from The City of Vancouver’s 125th Anniversary Grant Program. Support the creative young minds in your community by making a donation to ArtStarts in Schools and this project through Canada Helps (plese note "Kingsway" in the message field). Charity receipts will be provided. Our modest fundraising goal is $1000 - every amount donated helps! We also welcome donations of time and skill - we're looking for volunteers to help install this exhibition. Contact Exhibition Manager Keiko at keiko@artstarts.com to find out more. Enjoy more behind-the-scenes photos from the Kingsway Project on our Facebook page. While you're there, why not give us a "Like"?